You are here: Home » It’s raining outside…but not in my kitchen! It’s raining outside…but not in my kitchen! I did manage to get a spot of baking done on the weekend, and managed to get some great snaps of the feature ingredient of the featured recipe. One of my favourite website I visit daily (actually, make that multiple visit a day!) is the Apartment Therapy – The Kitchn offshoot site. The Apartment Therapy website is a great place for inspiration, aspiring designers, and people who love to look at beautiful spaces. 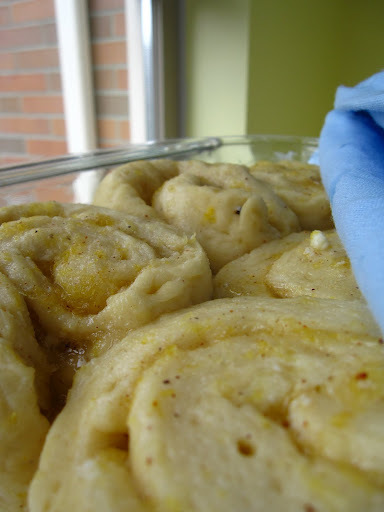 Anyway – last week, “the recipe” that captured attention was for Lemon Sticky Buns. 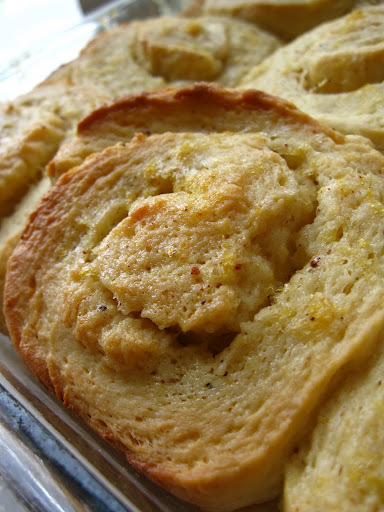 Say it with me now, “Lemon Sticky Buns”…mmm… I can’t help but put my Southern twang on it. I wasn’t the only one who fell victim of lust-at-first-sight – they gratuitously included the “money shot” on three different subsequent posts. So I had to give it a shot! It’s a yeast-based dough that requires a little bit of work. What does that mean? There’s a good chunk of waiting around time and you’re going to use your hands. The waiting around time, no problem – the elbow grease? My specialty. I really do enjoy kneading by hand – yes, it is very easy to stick it into the mixer to do all the work, but it’s so satisfying to work the dough by hand. The methodic turning and pushing can be very grounding…it’s just nice to work with your hands after a week on a keyboard. As per the recipe title, it involves a lot of lemons. Gosh, probably 5 or 6? A combination of lots of zest and maybe the juice of 2 or 3. Here are a few more zest shots for you. I couldn’t resist. Look at the pores on the zest – I can’t imagine my life without macro now. 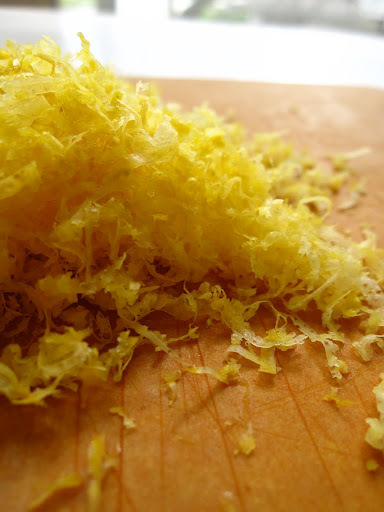 (left: Mmmmm….lemon zest. right: A little shameless product placement. 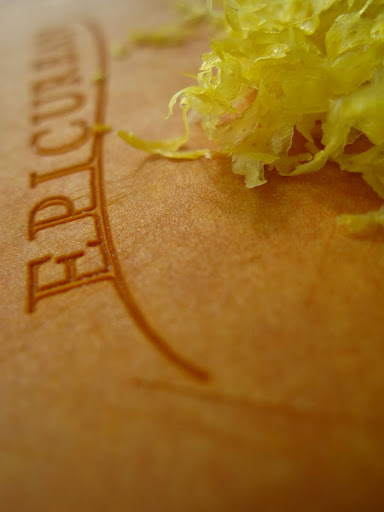 Epicurean boards, are you reading? I loooove yoooooou. 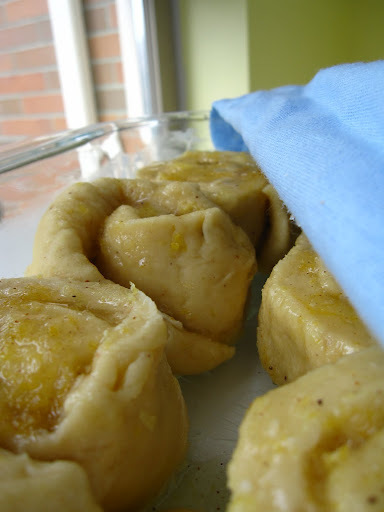 So after the dough has risen and is patted out, you have to apply a paste, the lemon filling. I took the recipe too literally and added the juice of half a lemon. A very, very juicy lemon. I really should have held back a little. The filling wound up being rather watery. If you make this recipe, go easy on the juice and hold off when the filling is thick but spreadable – like really, really warm and runny jam. Mine was like really, really, really warm and watery jam. As a result, my buns weren’t so lemon-y. Still good though! I’ve included a few before and after shots of the rising process. It’s really amazing to see how these buns puff up – ah, the magic of yeast! So would I make them again. Mmmm…probably not. 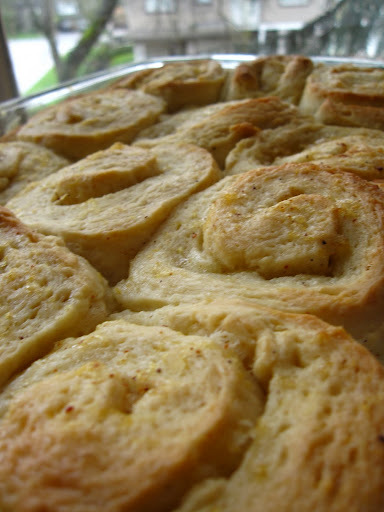 I’m glad I made them – but I’m not sure I’m a big fan of cinnamon-roll type pastries. It’s a little too dense for my liking. Then again, I take full responsibility if I made them too heavy. I will, however, always stop in my tracks for a Solly’s chocolate babka bun (it’s a tight, thin-layered ‘chocolate’ cinnamon bun. Microwave it for 20 seconds and it’s perfection.) – oooh…maybe I’ll have to give that a try. Mmm looks delicious! Anything lemon, sign me up for!